â€˜My Wife and I have a very dear friend who has been a huge Elvis Presley fan since he was a child. He seems to know every song that Elvis ever sang, let along recorded. 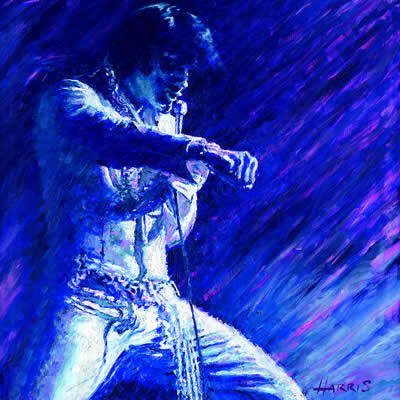 In conversation with him a couple of years ago, I found out, to my amazement, that it would soon be thirty years since Elvis passed away and I thought that this remarkable man, on stage, in his trademark white jumpsuit, would make a wonderful painting. 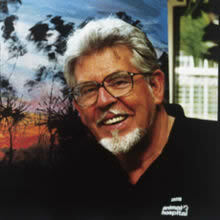 Personally I think â€˜Blue Elvisâ€™ reveals Rolf Harrisâ€™s versatility as a painter and this is an outstanding figurative piece of work in its own right; the fact that it is a tribute to such a beloved icon makes it even more satisfying to me.